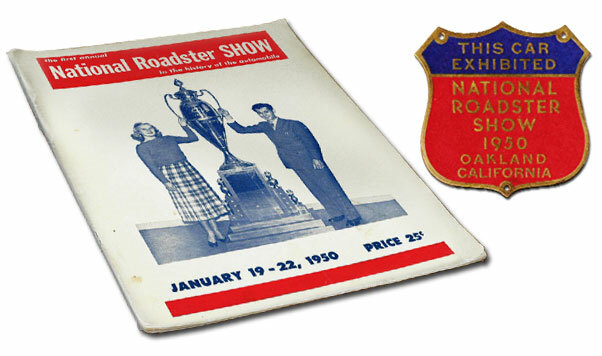 In 1950 Al and Mary Slonaker organized the first Annual National Roadster Show. Mostly entered by Hot Rods, but the Custom entries in this show has always been legendary. Lets take a look at the Custom entries at this first Oakland Show. There is something special about the Custom Cars being displayed to these early Hot Rod and Custom Car shows from the very early 1950’s. The first couple of shows at the Oakland Exposition Building as well as the Pan Pacific Auditorium in Los Angeles were Peterson held his Motorama show, as well as some early shows in Indianapolis. They all have a pure feeling, Custom Cars being displayed with the hoods and doors closed, just to be enjoyed for their exterior beauty, no distraction from out of this world displays, colored light for special effects. Pure about the cars, pure about the art of custom restyling. Hot Rod October 1949 issue announced the first Annual National Roadster Show. The full page ad only showed Hot Rods. In the late 1940’s the Hot Rod and Custom scene was blooming like never before. In 1948 the first Hot Rod shows had been organized which had a huge impact, and more an more smaller events were organized. During this time the Hot Rodder’s did not have a very good name with the general public. Driving too fast, drag racing on the streets and several heavy accidents had given them a bad name in the local news. A lot of car clubs as well as Hot Rod magazine were working hard to proof this bad reputation was not based on the reality. 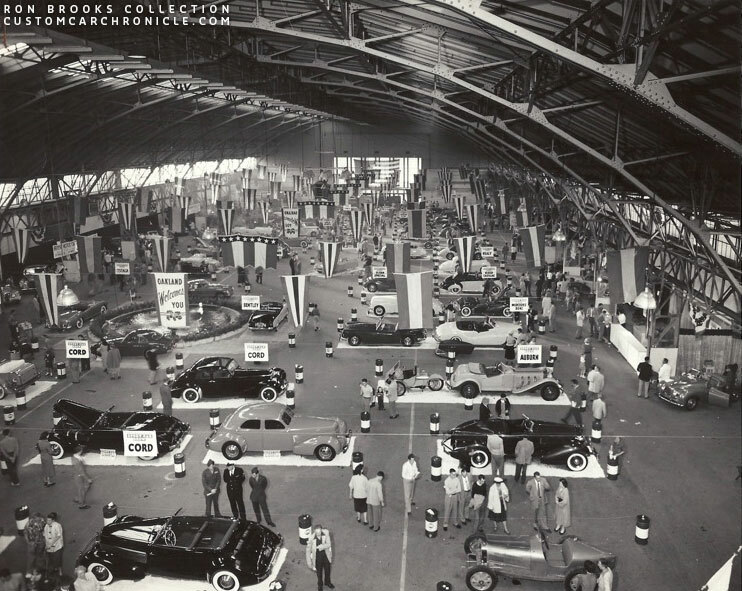 In 1949 Al and Mary Slonaker organized and International car exhibition at the Oakland Exposition building featuring mostly Foreign Sport Cars and exclusive automobiles. 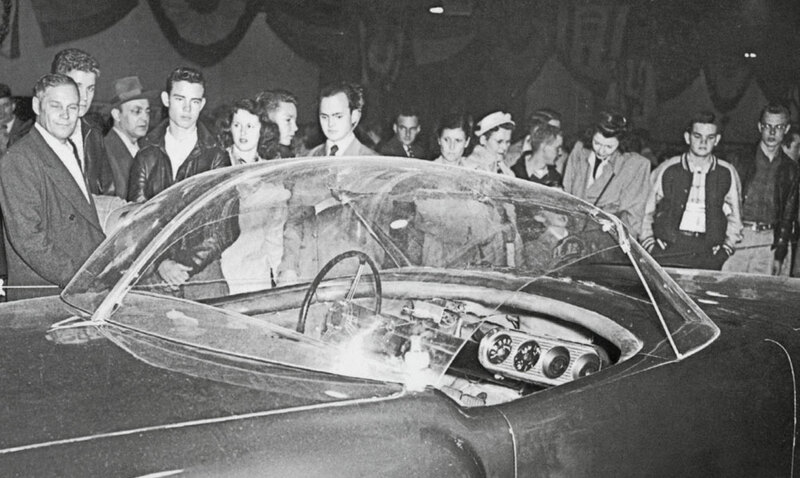 However not too long before the show date, the Slonaker’s were introduced into Hot Rodding. They really enjoyed the scene and saw how enthusiast the Hot Rod club members were. 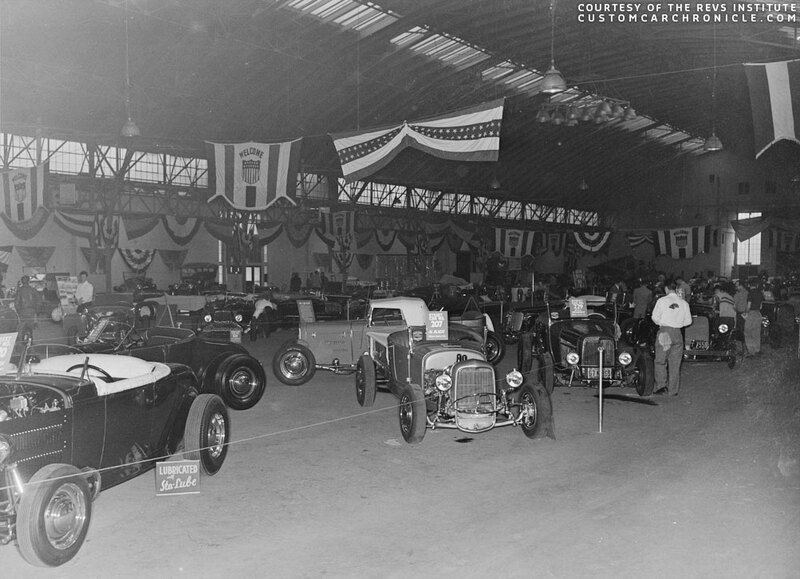 They decided to include a few Hot Rods and Custom Cars in one corner at this first car show organized in the Oakland Exposition building by them. 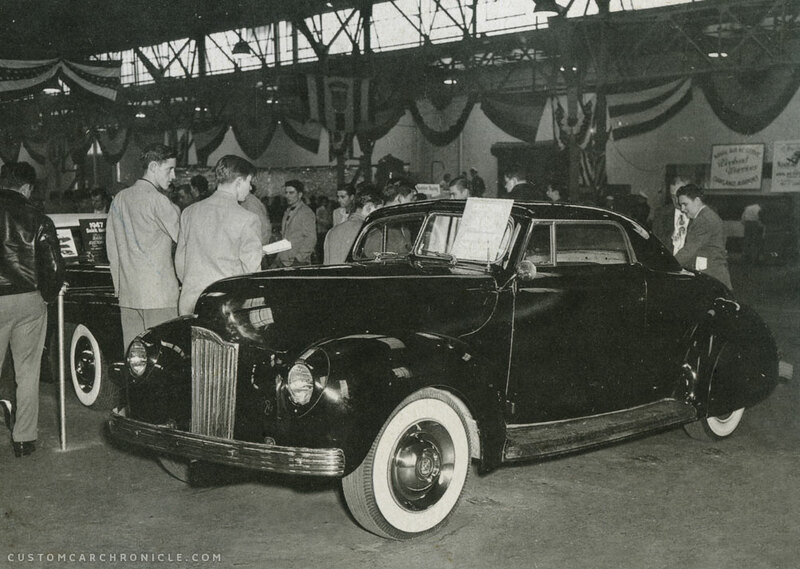 Only around 10 Hot Rods and Customs were part of this 1949 show, but the crowd like these cars much better than the Sports Cars and exclusive Automobiles. 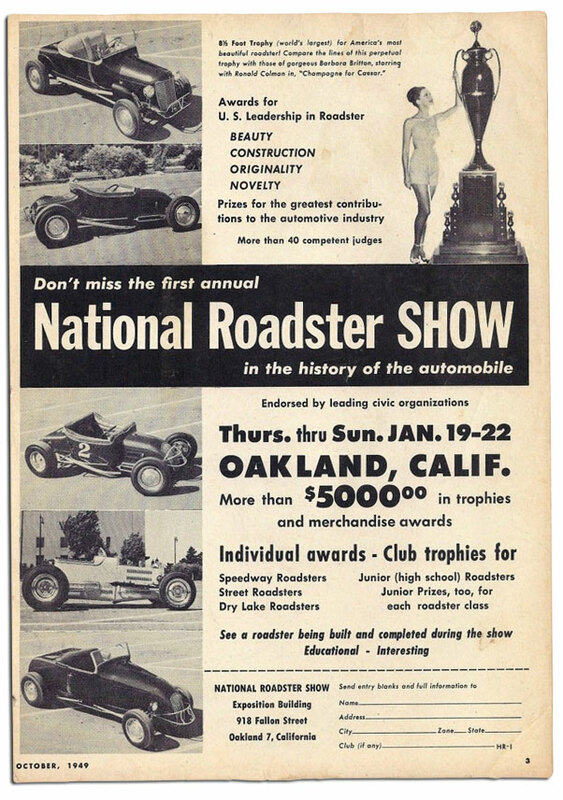 So when the plan was developing for a 1950 show the Slonaker’s decided to build a show around just Hot Rods and Custom Cars, and ended up naming the event the NATIONAL ROADSTER SHOW. One of the main reasons the show was named Roadster show, instead of Hot Rod show, was because there was still some negativity around the Hot Rod name from the common public. Posters and flyers were printed and handed out to as many hot rodder’s as the organizing team could find. The Kustoms of Los Angeles club had to drive around 500 miles from Los Angeles to Oakland. 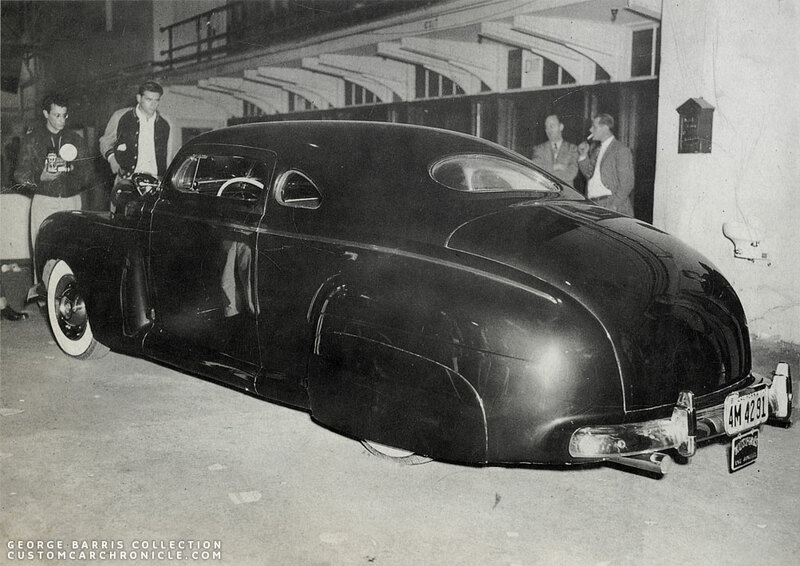 Back then Custom Cars were driven on a daily base so the guys drove their Custom Cars to the show, no trailers. Apparently at one point it started to look like there might only be Hot Rods and Race cars entering the show. 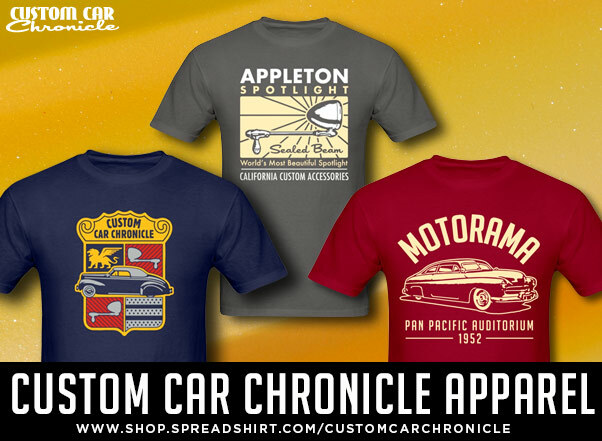 The Slonaker’s called George Barris to see if he would be interested in gathering a few of his Kustoms of Los Angeles club members to make the trip from Los Angles to Oakland. An around 500 mile trip for an 4 day event, which was clearly not doable for everybody. George Barris remembered how much good the 1948 Hot Rod Show in the LA Armory had been for him and his business. George managed to get a few of the club members interested and they made the 500 mile trip. We know that Jesse Lopez and Ben Mario went with him from LA, and Joe Urritta brought his 1941 Ford, but unsure if he brought it straight from the Barris Shop in Bell, or from his home in Fresno, which is about half way from LA to Oakland. 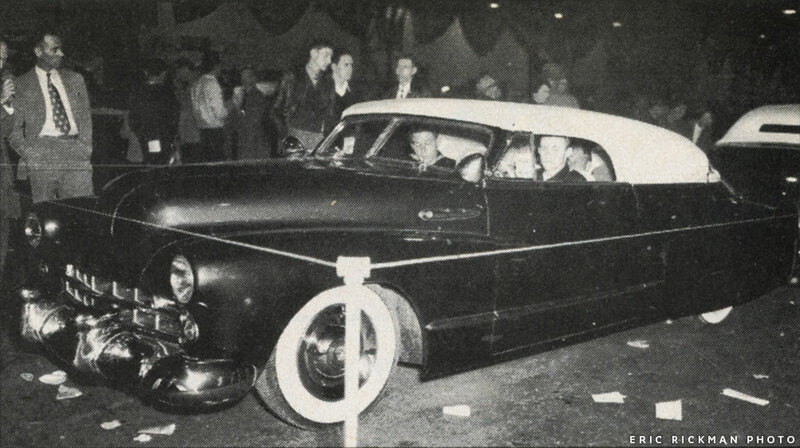 I have read that Barris brought six cars to the first Oakland Roadster Show, but so far I can only find evidence for three Barris Kustoms. Some other Custom Car owners more local were contacted, so in the end there were some Customs at this very first Annual National Roadster Show, but by far the numbers the show would later attract. 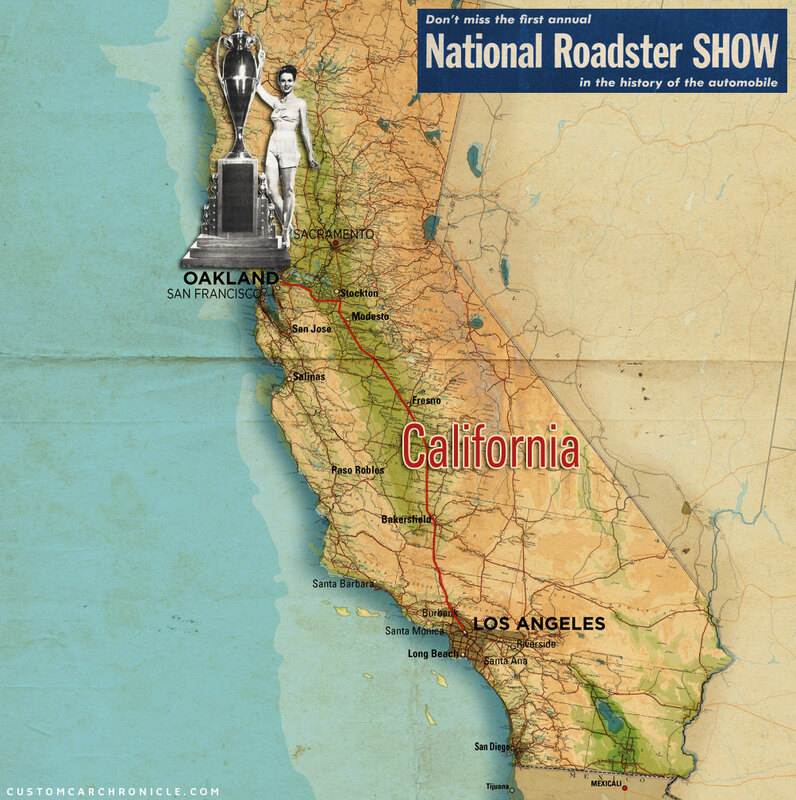 The first National Roadster show was held from Jan 19 till 22, 1950. I turned out to be a huge success. In the four days the show was open 27,624 spectators visited the Oakland Exposition building to see the 100 cars on display. This show did a lot of good things for Hot Rodding and Customizing. And the general public had now witnessed the high quality Hot Rods and Customs and placed these in a whole new perspective than the local news previously had done. In the March 1950 issue of Hot Rod magazine there was a massive almost 5 page with a great number of photos feature article about the show. Sadly none of the photos were of the custom car entries at the show. 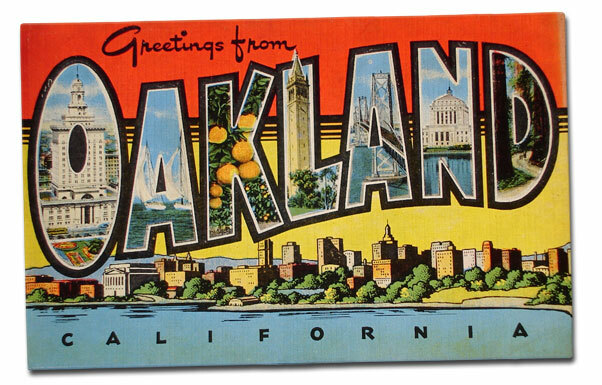 The show would soon be named “Oakland” by a lot of people. Just because the National Roadster Show was just a too long name. Later in its life the show was renamed Grand National Roadster Show and is today best known as GNRS. The first National Roadster Show was held at the Oakland Exposition Building located across the street from the Oakland Auditorium, nearby beautiful Lake Merrit. The building address was: Exposition Building, 918 Fallen Street Oakland 7, California. The Building was a nice size and could hold up to at least 100 cars. However I have heard from several people who attended the first couple of shows held at the Oakland Exposition Building that they revered to it as the biggest little show. Pointing out that the building was soon to be considered to small for traveling from all over California, and further. But the quality of the cars was alway high, and the show was an magical event from the early days, and it would become to longest still running car show around. The Bay area had many Hot Rodder’s and Custom Car enthusiasts with high quality cars, but the show always had a good number of cars from the Los Angles Area, and even from out of state from the beginning. The outside of the Oakland Exposition Building. This photo it taken from the parking lot and was taken later in the 1950’s. 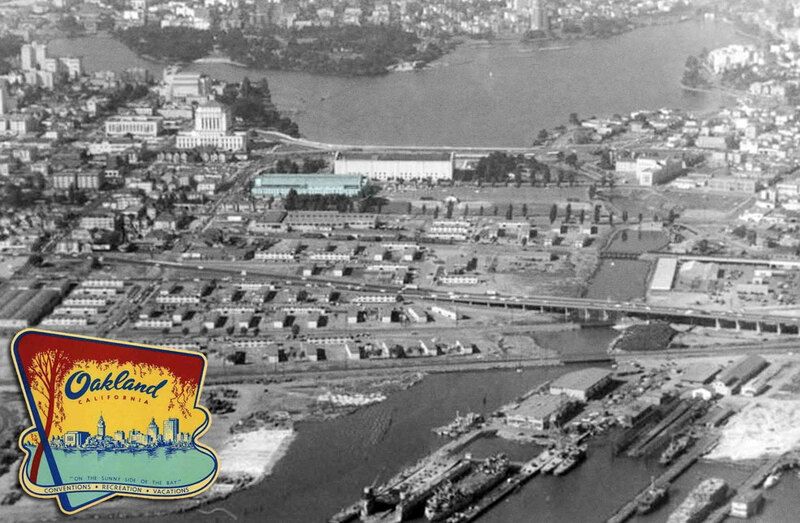 Aerial view shows the Oakland Exposition building in light blue with the large parking space out front. Lake Merrit is in the background, behind the white Oakland Auditorium. 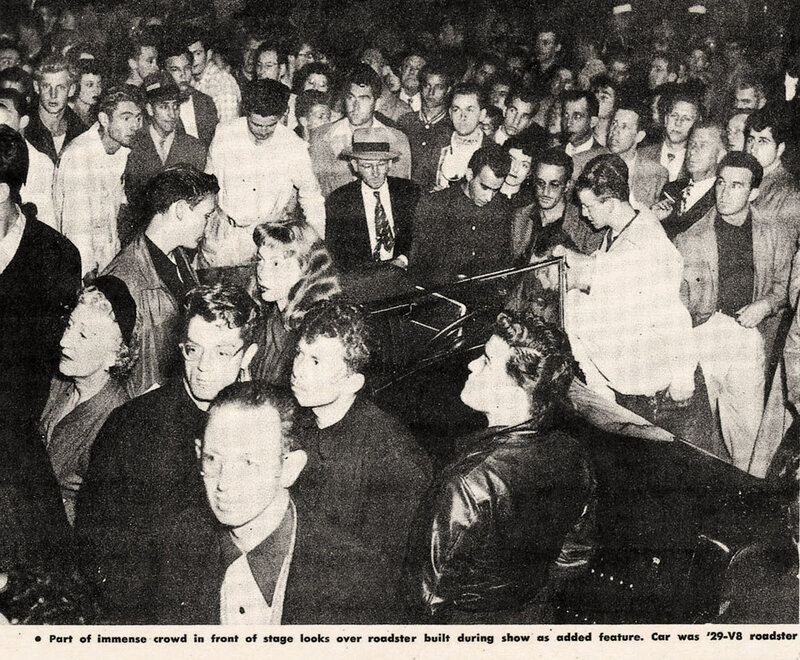 This photo is NOT from the 1950 show, but rather from an Sport Car show from 1952. I have included it in this article because it really gives a great look at the inside of the Oakland Exhibition Building. This is a photo that was taken at the 1950 National Roadster Show. There are no Customs showing at all, even though the photo shows a pretty large section of the building. Which says a lot about the amount of Customs versus Hot Rods show in 1950. 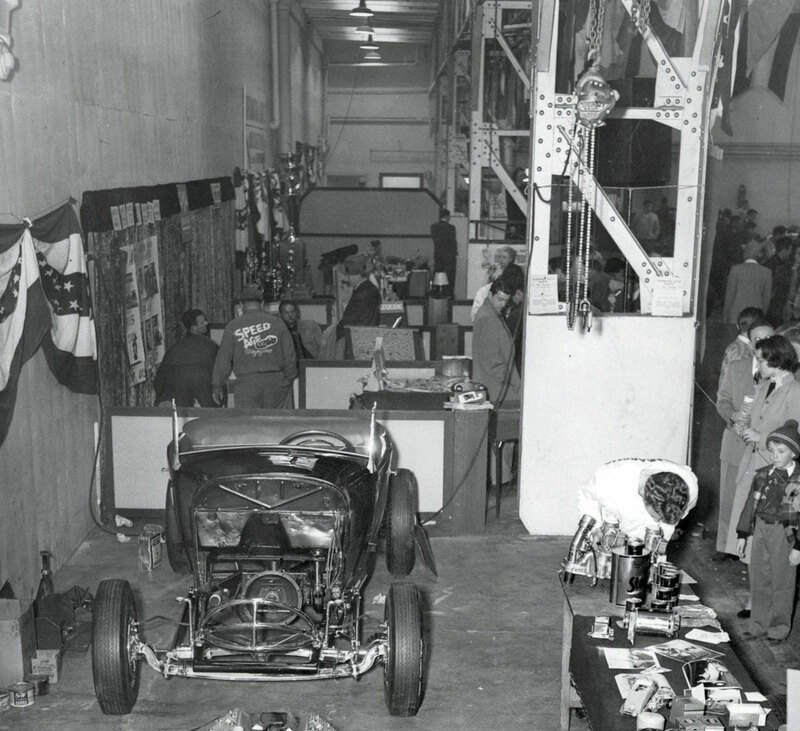 I have included this Hot Rod filled photo to show how the building looked at the 1950 show, it gives a great overall impression. During the 4 day show a special team was building a Model A Roadster at the show. This photo shows the finished Hot Rod on Sunday, and how many people visited the show. Everybody was really impressed with the quality of the cars at the show. Something some might not have expected after all the negative news reports about the Hot Rodder’s. Ben Hubbard’s Auto Parts had a team of four guys assemble the Model A Roadster at the show. I have included this photo here since it gives a nice feel for the back side of the building where the vendor booth were. 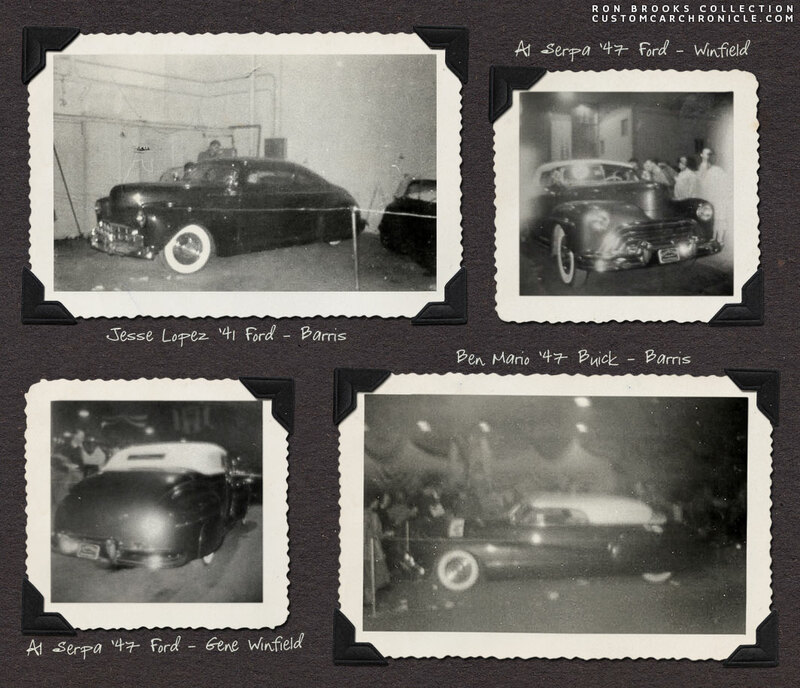 Ron Brooks shared these rare a snapshots from the 1950 Roadster Show. It shows Jesse Lopez 1941 Ford, (#204 – 414), Al Serpa’s 1947 Ford (#403) and Ben Mario’s 1947 Buick (#211 – 411). Ron received the photo’s from a friend who visited the show in 1950. 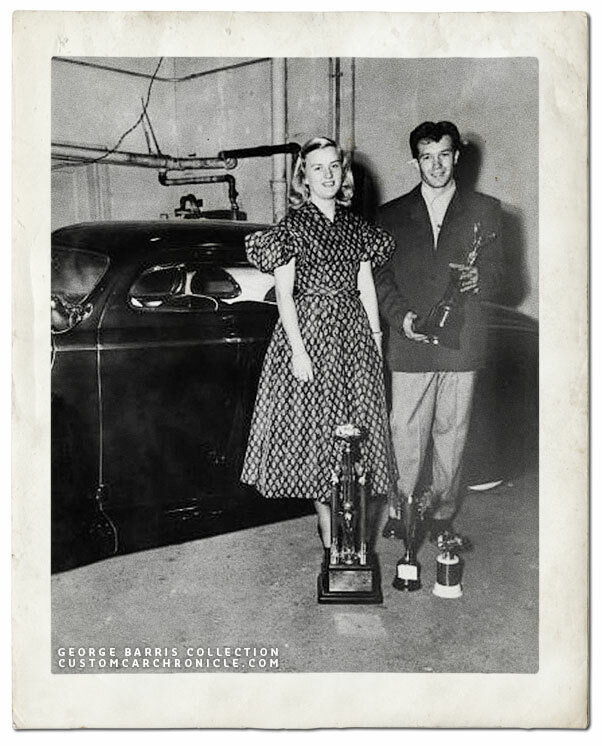 The 1950 National Roadster SHOW program with Miss California Jone Pedersen and race driver Freddie Agabashian next to the eight-foot trophy. Next to it the exhibition tag. In the last few month before the show the entries came in, some with photos, others not. A selection of cars was made to be included in the first annual show program From all the cars listed and shown in the program only 6 cars were Custom Car. 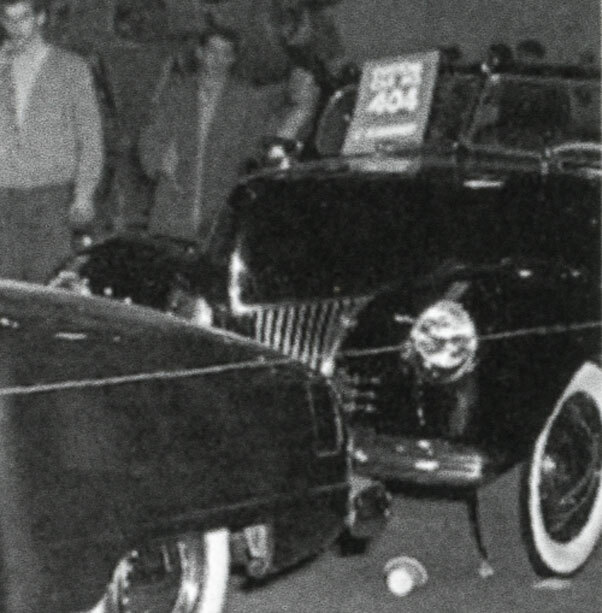 From all these 6 cars, except the number 402 car, 1940 Chevy convertible from Bert Gericke we have been able to find some photos taken at the show. Possibly Bert could not make it to the show in the end, or his car was simply not photographed that much and photos of the car at the show have never surfaced so far. By the time the Show Program booklet was put together the organization had developed a kind of odd numbering system. If you look at the numbers the customs have assigned to it does not really make sense. Jesse Lopez 1941 Ford Coupe has a 200 number, which is for Street Roadsters. It appears that after the program was printed it was decided to give all the Custom Cars that entered the show would receive an 400 number. The 414 and 411 numbers on Jesse and Ben’s Barris Kustoms at the show make me believe that is what happened. 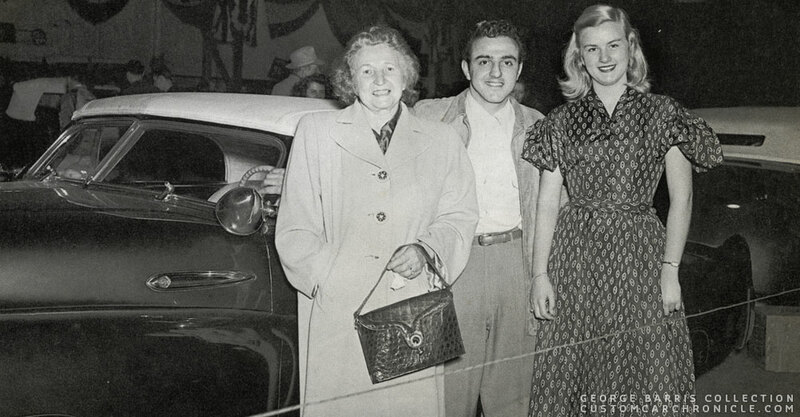 George Barris posing with Miss California Jone Pedersen on the right and aunt Edith on the left. Edith raised both George and Sam in Roseville Ca, after their birth mother had passed away when they were still young. The car behind them is Ben Mario’s 1947 Buick (#211 – 411) with a fresh chopped windshield and panoramic rear window Gaylord padded top. The padded toped car on the far right is Al Serpa’s Ford. Vince Gardner 1947 Studebaker (#401) with behind it a mystery custom entry with number 404. An unidentified 1939 Ford convertible. Non of the cars had any kind of display material used. Just parked on the floor with a rope around it. Notice the large amount of garbage on the floor. In 1950 the Vince Gardner 1947 Studebaker most likely had the first ever plastic “bubble top” ever made. The car made a huge impact at the show. The unidentified #404 1939 Ford Convertible sitting behind Vince Gardner’s 1947 Studebaker. If any of the readers knows anything about this car, please let us know. Al Marx took his uniquely custom restyled 1934 Ford Roadster to the show #206. Al’s Ford used to belong to Wes Collins when it was painted black. 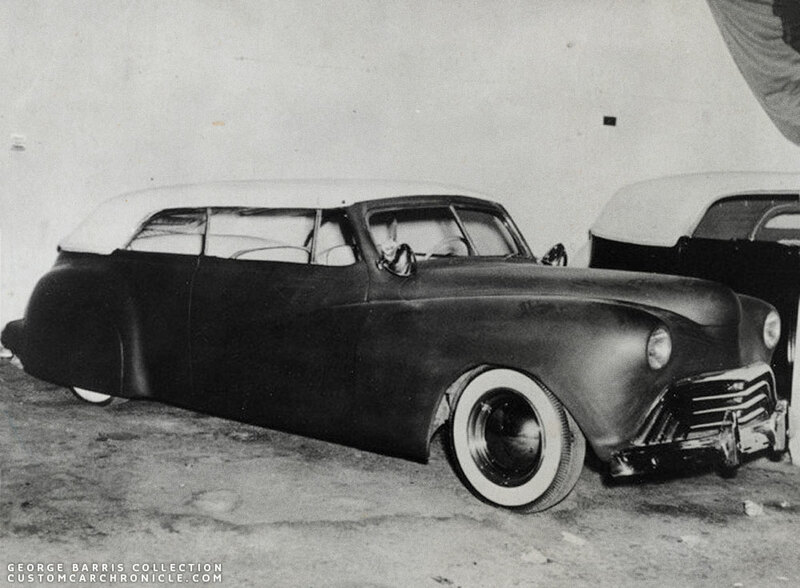 The car was done as a full custom with a DuValle windshield, fender skirts, Lincoln bumpers an set in license plate. The interior photo shows the unique engine turned dash. Lon Hurley created an uniquely styled Sports Custom based on an 1946 Cadillac with many 1948 Cadillac parts. He restyled it into a two seater with plastic wrap around windshield (#209). 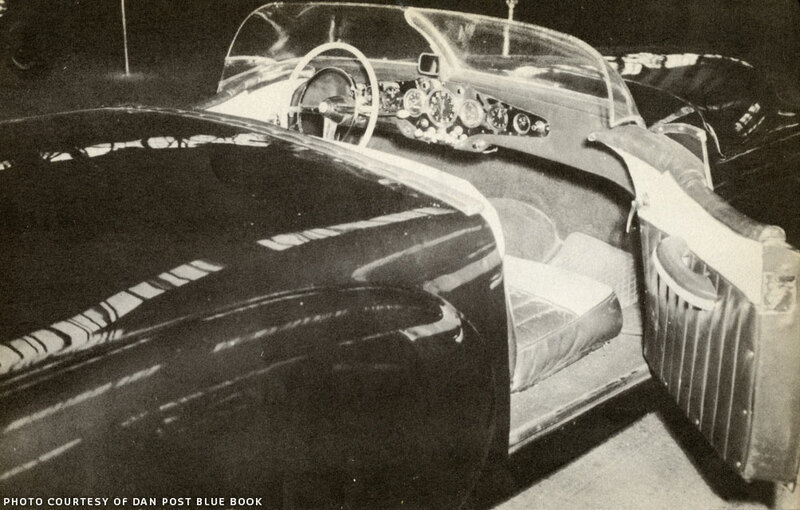 The car looks very elegant and streamlined and Lon Hurley won the Most Spectacular Custom Roadster award with the car. Gene Winfield was from nearby Modesto Ca, and made sure his latest custom, a 1947 Ford Convertible (#403) with Hall top for Alvin Serpa was displayed at the show. Al won the Most Spectacular Custom Convertible award with the car. On the right we can see the panoramic rear window in the Gaylord top of Ben Mario’s 1947 Buick. Ben Mario’s 1947 Buick (#211) was restyled by Barris and had just received a chopped windshield and new padded top by Bill Gaylord. Not sure why there are so many people in the car during the show. Behind the Buick on the far right of the photo we can see the Hall top of Alvin Serpa’s Winfield restyled 1947 Ford. 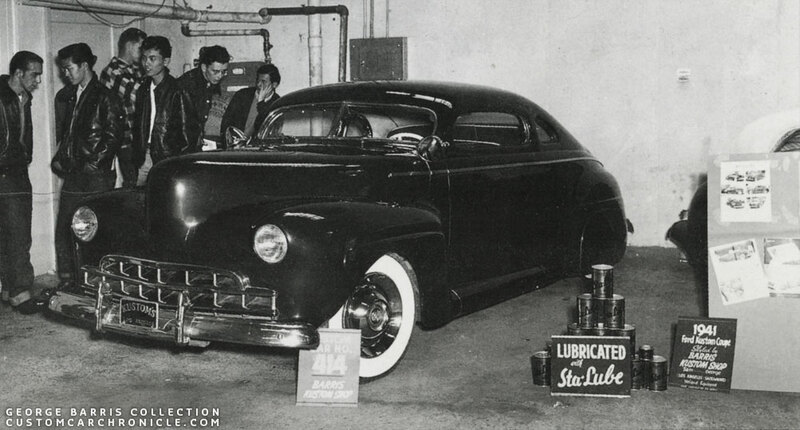 Joe Urritta from Fresno, Ca, had Sam Barris restyled his 1941 Ford Sedan at the Lynwood shop. It looks like the car was either still in primer, or freshly painted and waiting to be rubbed to a high gloss. We have not been able to find the 1950 show number for Joe’s Ford. 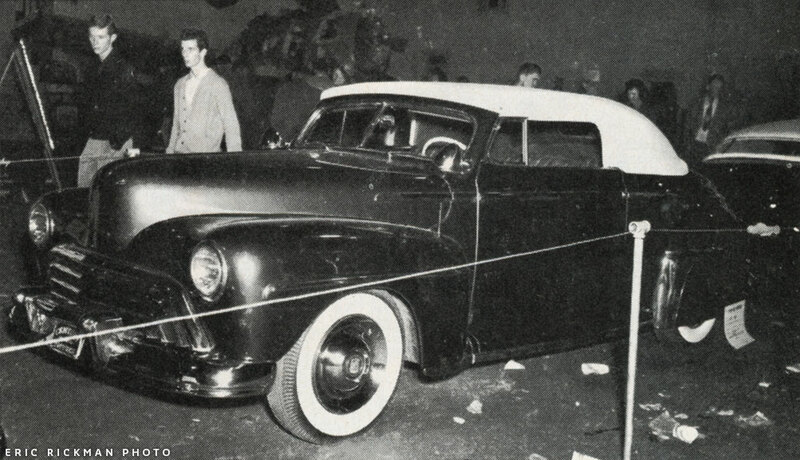 The car next to Joe’s ’41 Ford appears to be a padded topped 33-34 Phaeton, not sure if it can be qualified as a Hot Rod or Custom, this is the only photo I have seen that shows it. In 1950 Bruce Glenn owns the 1939 Ford convertible (# 405) with metal lift off hard-top restyled by Harry Westergard. Westergard originally restyled the Ford for Mel Falconer and used to have a padded top. Next to Bruce’s Ford we can see the front wheel, fender and top from Ben Mario’s Barris Buick. 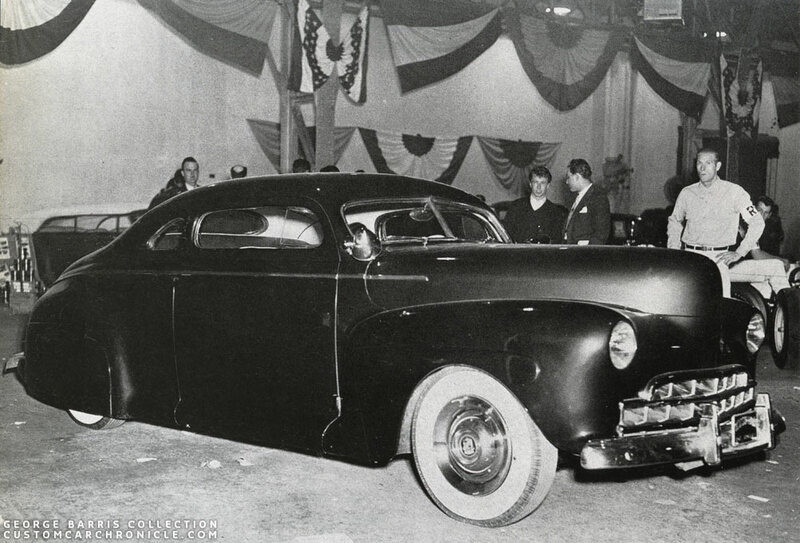 Jesse Lopez’s 1941 Ford (#204 – 414) had been finished two years prior to the 1950 Oakland Show, and had never before been in any other show. Jesse would not put it into another show after it either. But later owner Danny Lares loved to show it around. Jesse’s Ford looking really great at the show. Behind the car we can see Joe Urritta’s Ford sitting against the wall. It appears that Jesse’s 1941 Ford was moved around a bit during the show. Here the car was parked with its back agains the wall and a kind of ugly wall on the sides taking way fro the beauty of Jesse’s Ford. The car behind the show board on the right is the Barris Restyled Joe Urritta 1941 Ford. Back in 1950 the cars at the shows were drivers. 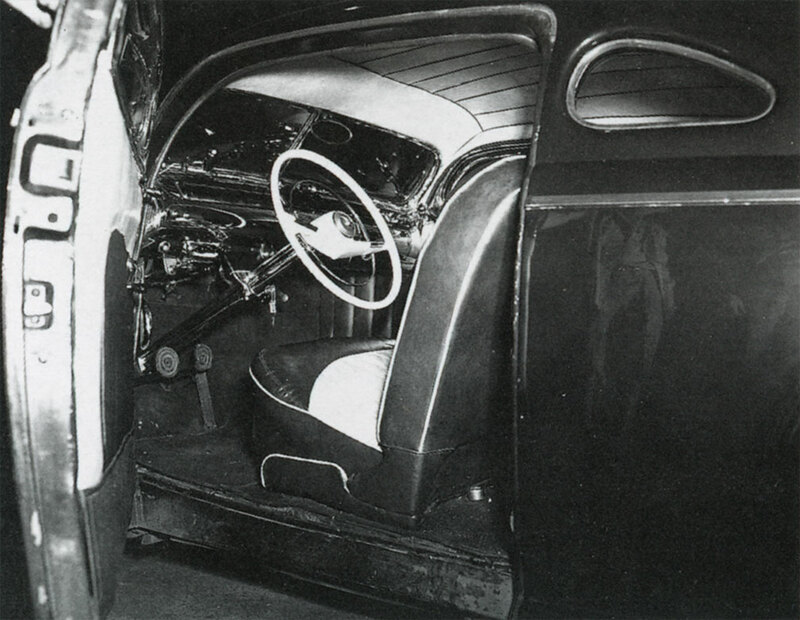 Jesse’s Ford had been on the road for two year, and the dirty door jambs show that it was not a common thing back then to open the doors at the shows. Jesse Lopez had Custom Car no 414 at the show, but was listed as 204 in the program. It looks like at the show it was decided that all the custom entries should have a 400 number. The show cards at the early shows were all hand painted, and in the first couple of years each year card had a different design. Jesse also had an hand painted sign made, or perhaps it was done by Barris. 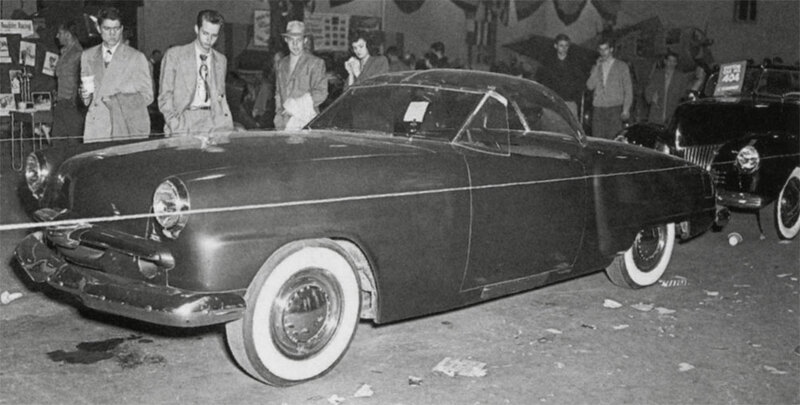 The display methods of George Barris were still rather crude at this 1950 Show. 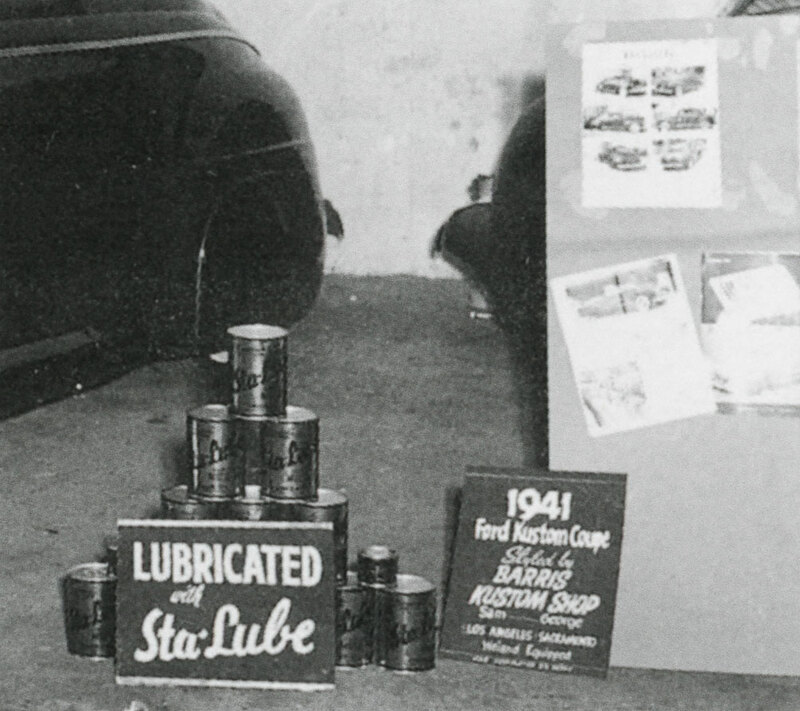 A sponsored StaLube sign, a custom sign for jesse’s Ford, and a board with a couple of Barris Customs from the pages of Motor Trend magazine to promote the Barris Kustom Shop. 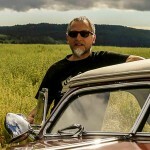 Interestingly Jesse’s Ford is being described as being Styled by BARRIS KUSTOM SHOP Sam … George Los Angeles & Sacramento! After the award ceremony all the winners get together for a photo-shoot. 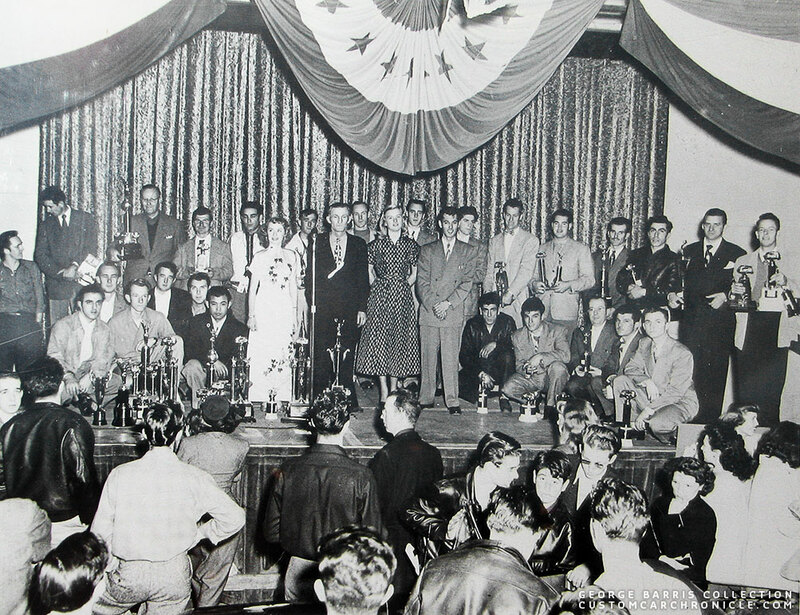 George Barris is kneeling with his trophies on the far left of the podium. Jesse Lopez won First Place Special Devision with his 1941 Ford. Here Jesse is posing with Miss California and the trophies. George Barris posing with the awards Jesse had won, with Miss California inside the car. 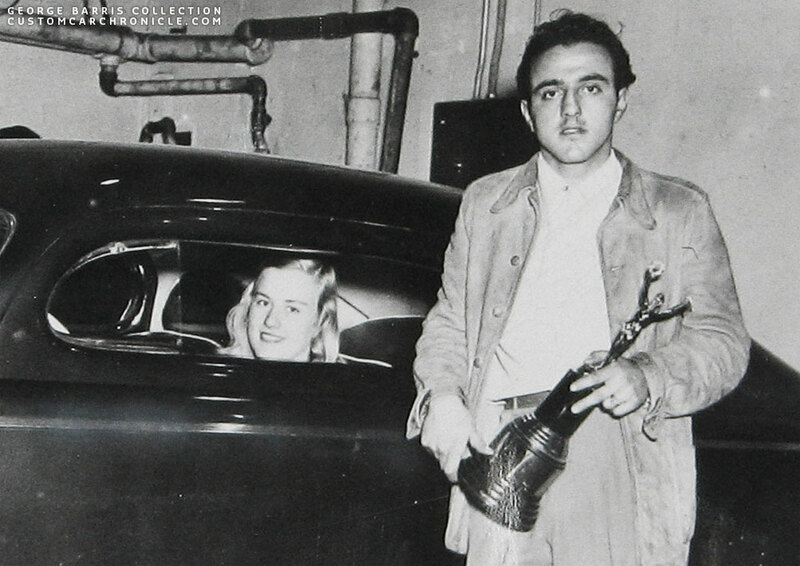 Close up of George Barris with the Special Devision trophy and Jone Pedersen inside Jesse Ford. 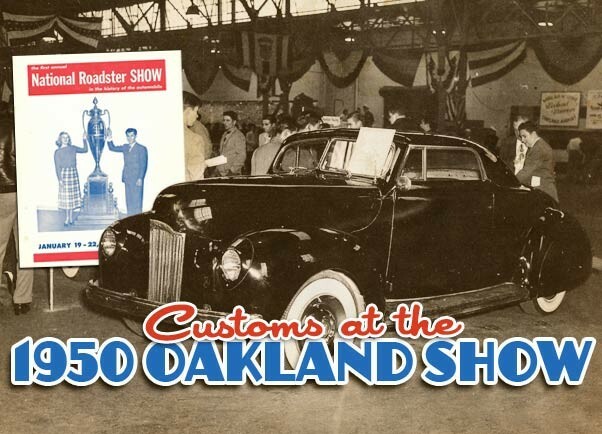 So far I have been able to find evidence for 10 Custom Cars at the First Annual Oakland Roadster Show. I’m not sure if this is the complete list or if there were more at the show. There have been shared a nice amount of photos taken at this 1950 show, but most of the photos were taken of Hot Rods, and how only other Hot Rods in the back ground. The people who we talked to about the show could not really remember much about the show. And how many Customs there were. If any of the CCC-Readers knows more, please let us know. Special thanks to Ron Brooks for helping me a lot with this article. Notice too how NONE of the Hot Rods were running Wide white wall tires and All the customs were. It is so much fun to look over these actual images of cars that were driven to those early shows. For Memo, Torchie, me and so many others privileged to have come up “back in the day”, some real nostalgia. For Rik and the craftsmen of today, such inspiration. For all, older and younger, the Fun of it all comes through clearly. Hope we never lose that all-important Fun Factor! 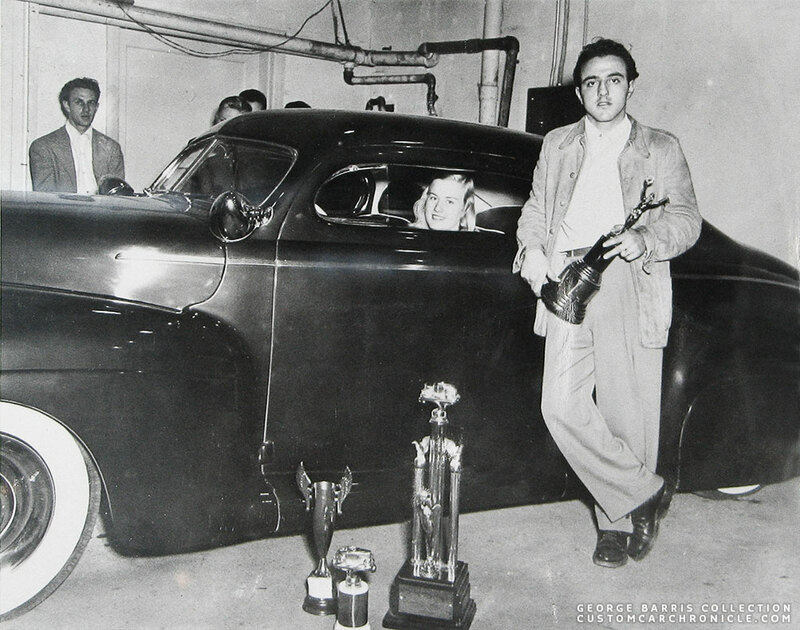 Very cool article…makes me wonder who won 1st place for Greatest Contribution to the Auto Industry if Barris won 2nd. According the Hot Rod Magazine article Alex Xydias and Dean Bachelor won the first price for Greatest Contribution to the Auto Industry. The Program for this show is highly collectable and rare, bringing hundreds of dollars. My friend who attended said there was a garbage can at the exit of the show and as most people left , they tossed their program in the barrel! Who Knew? 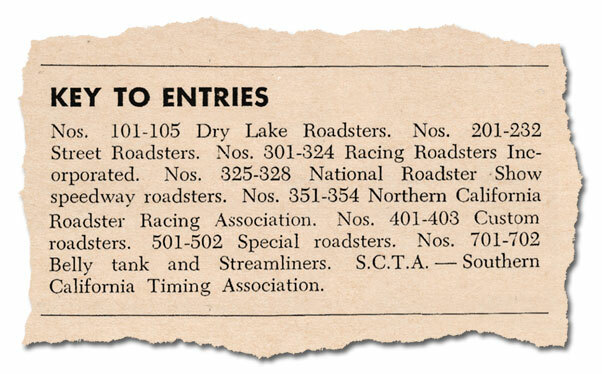 One of the main guys who was building the roadster for the Oakland roadster show was killed just not long after at the S.C.T.A event in his own car. There is a photos of him I think holding a set of Buick finned brake drums, And he is working on the roadster.